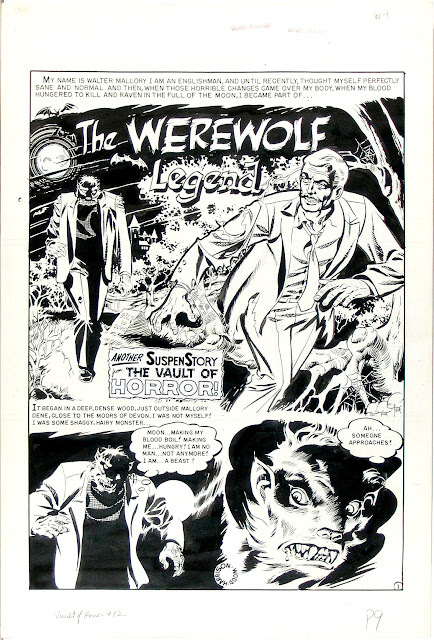 Recently I was talking about artist Reed Crandall and how many werewolf stories he had done over the years. 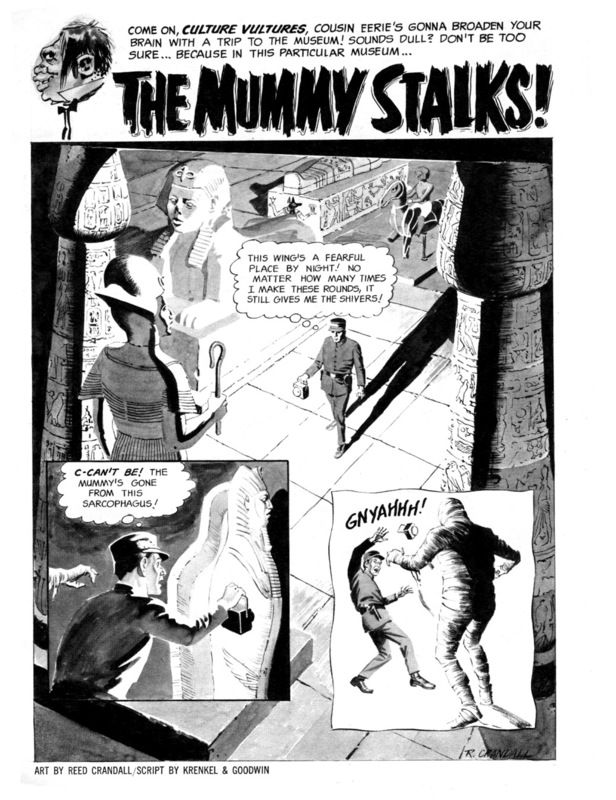 Searching through my database I happened to come across this classic tale by Crandall that features another character from the horror pantheon, that being mummy dearest. 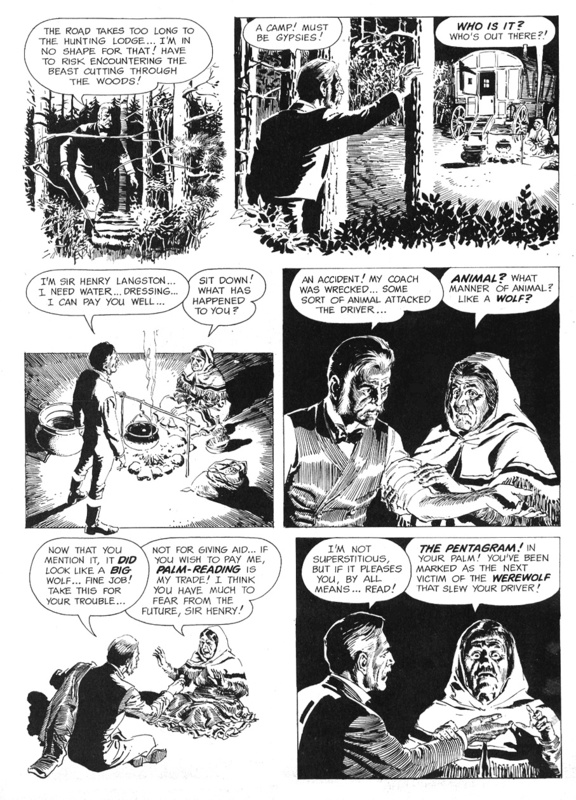 I realize I showcased Reed Crandall in just the past week or so, but I didn't think you'd mind seeing more from him. I believe that you just can't go wrong with a well done work by a master like Crandall. 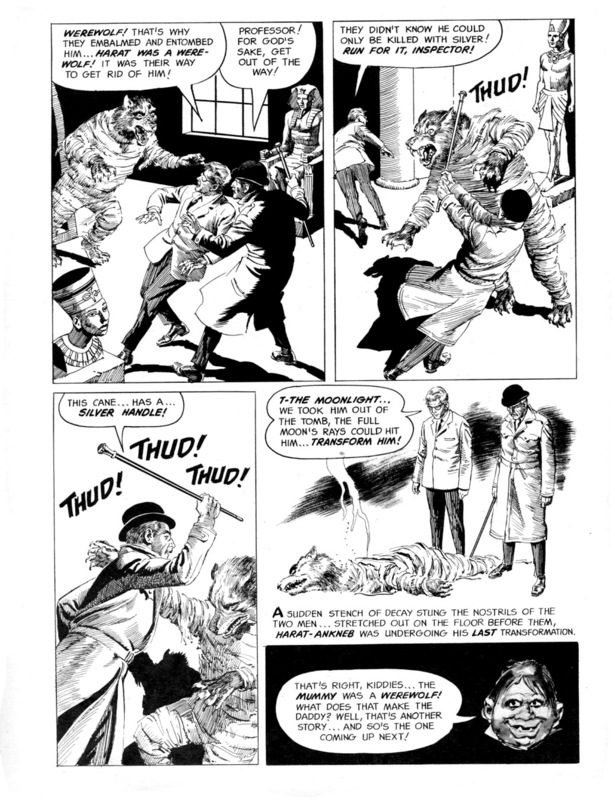 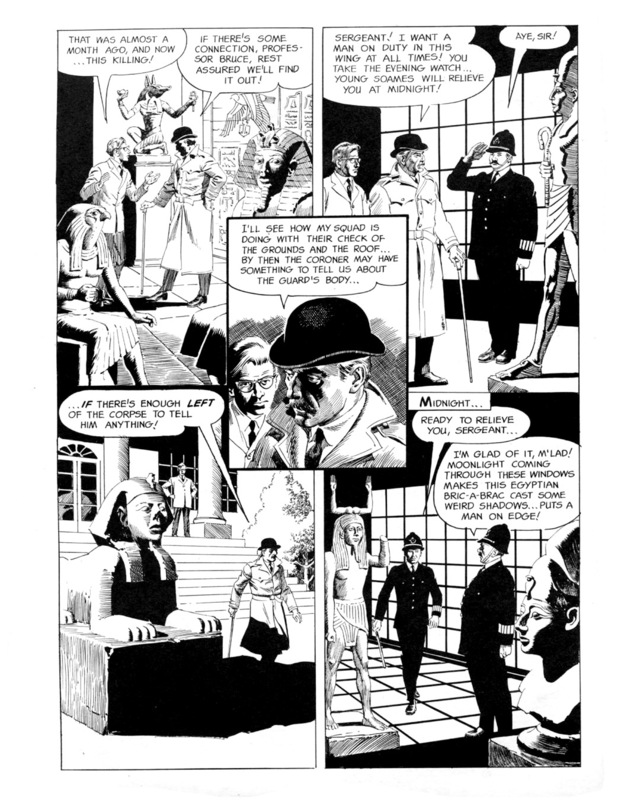 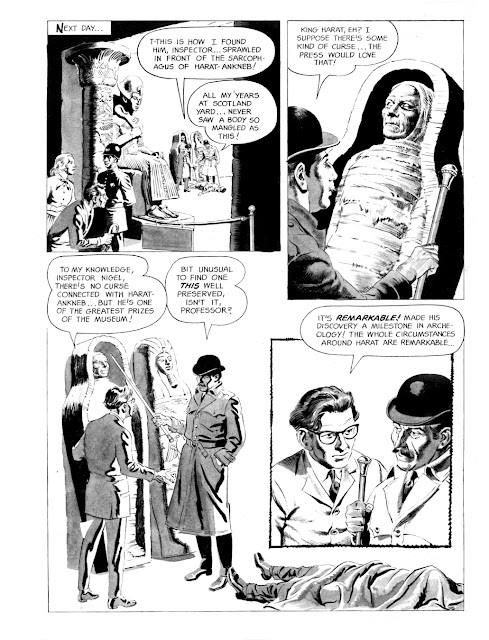 This time, the duo of writer Archie Goodwin ( here joined by another artistic master Roy Krenkel, who probably provided the plot) and artist Reed Crandall draw our focus to the scene of some unexplained murders occuring in the shadowed halls of a dark and musty London museum, where one of Scotland Yard's best detectives is brought in to try and solve the mystery before the deranged culprit adds to the growing body count. He'd better be quick about it, because every time they turn around they stumble across another mangled victim. Ha! 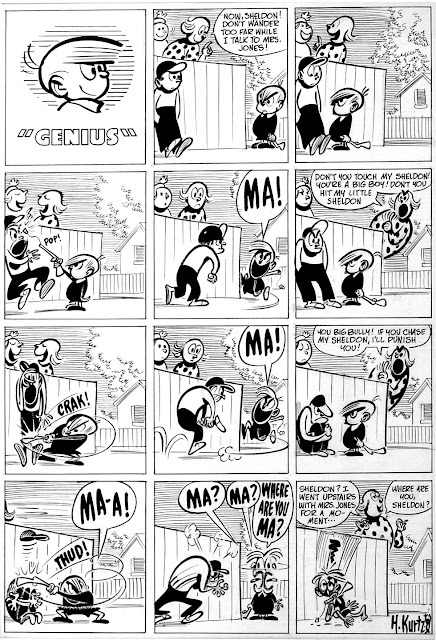 Fooled you! 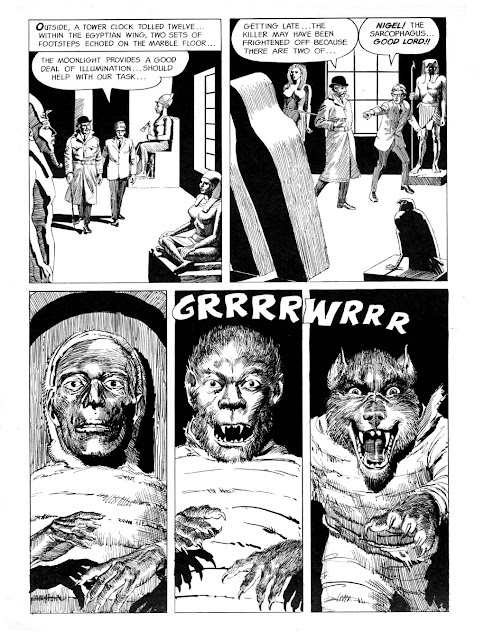 Did I neglect to tell you that Mummy was a werewolf? 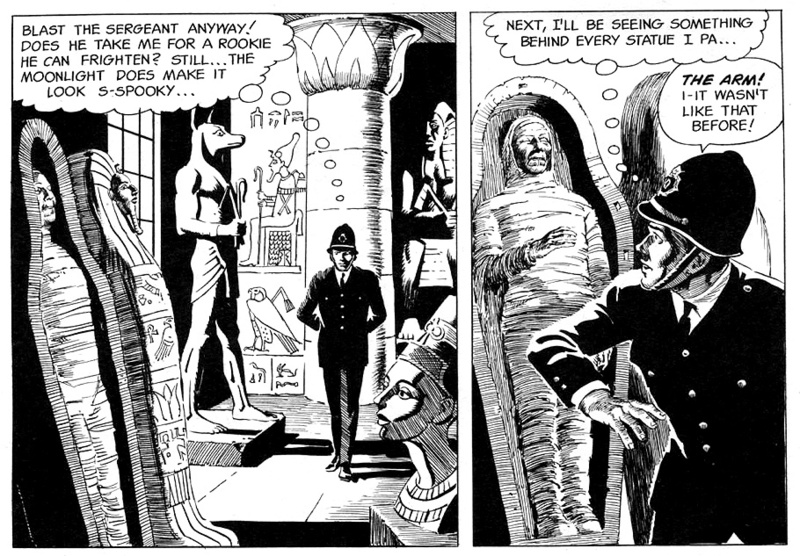 Must have slipped my mind...terribly sorry, old chap! Seems it turns out this was another of those famous Reed Crandall werewolf tales after all! 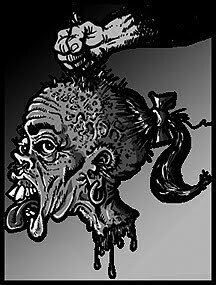 Some of my favorite art from the Warren horror line was created by today's artist, Dan Adkins. 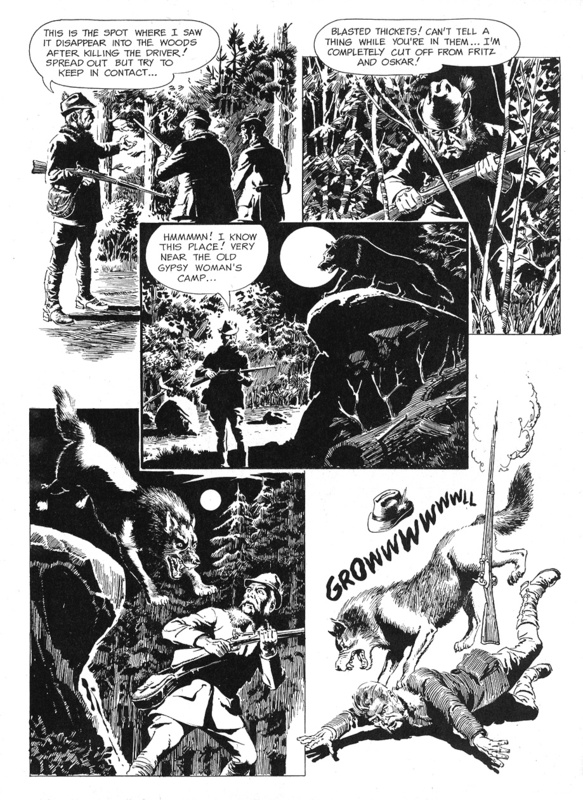 The fact remains that Adkins is a fine artist, painter, penciller, and inker, and his work deserves to stand on it's own merits, and today's story is certainly no exception. 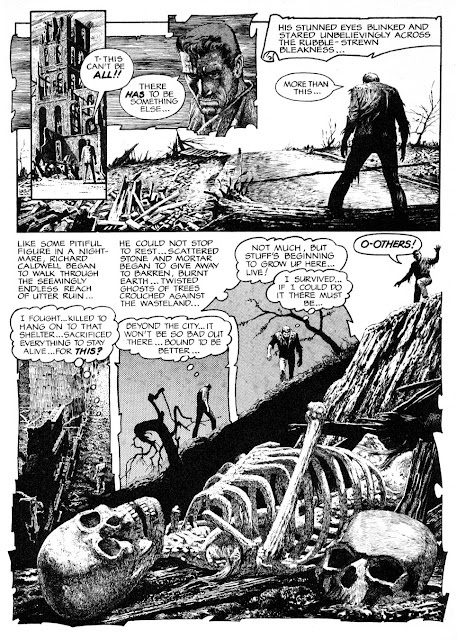 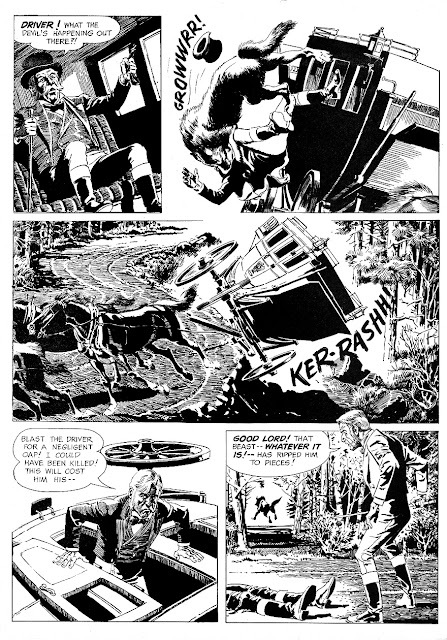 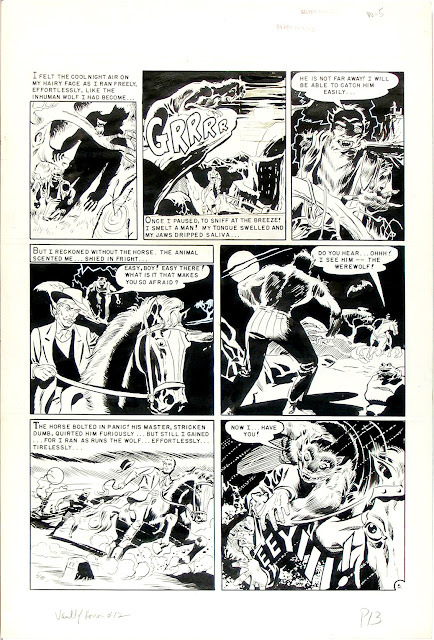 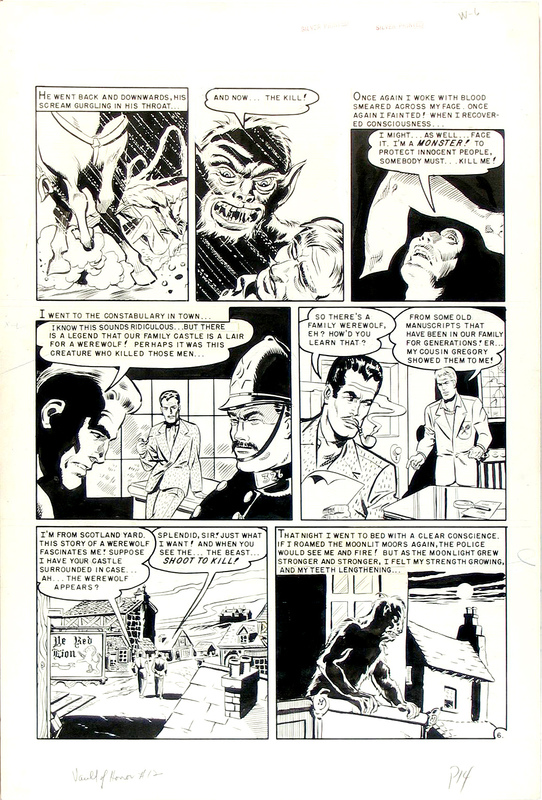 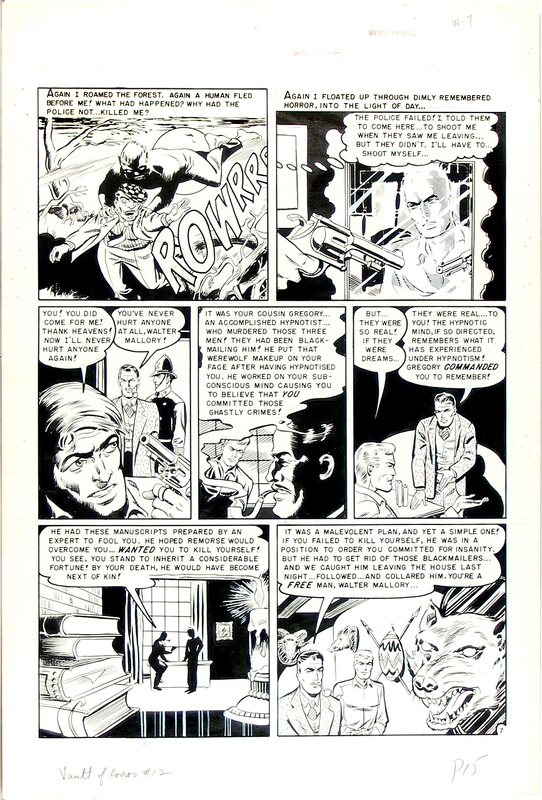 From EERIE # 8, 1967, THE DAY AFTER DOOMSDAY was created at the beginning of his career in comics and highlights Adkins' finesse with fine lines while it showcases his skills for solid forms and shadows. Where other artists work in a loose and carefree fashion, Adkins invariably brings a completeness and a level of detail beyond most of his contemporaries that is unavoidably reader-friendly and instantly enjoyable to the eye. 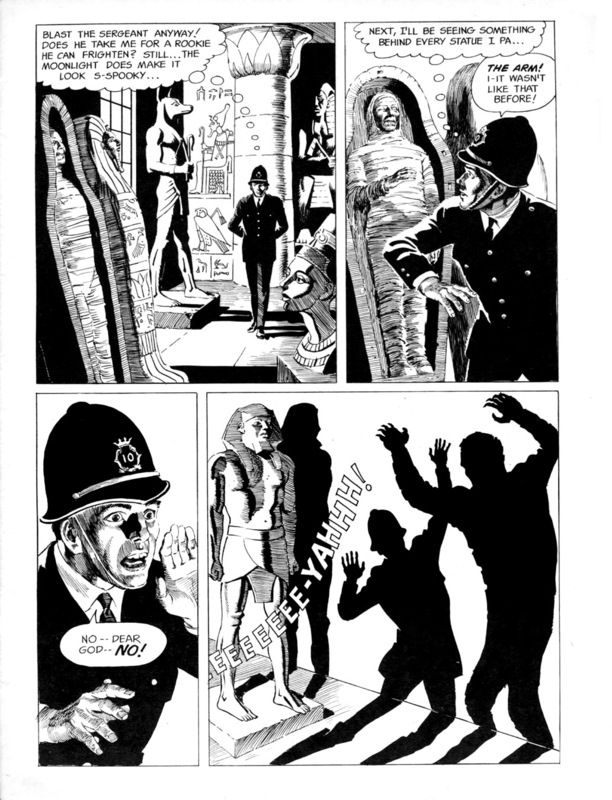 Click here to read a fascinating interview with Dan Adkins. 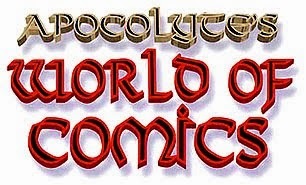 as well as on DOOMSDAY itself! 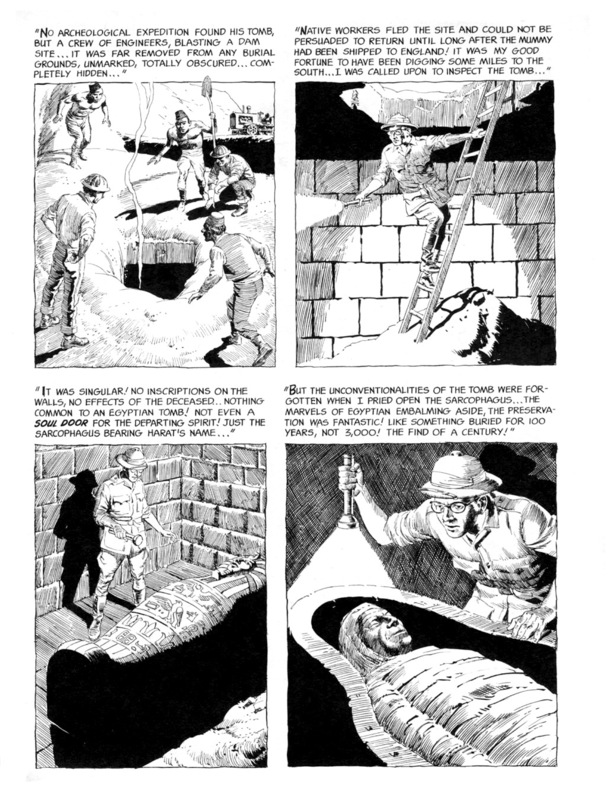 Today's feature is a story that was the collective creation of Harry Harrison, Wallace Wood, and Gardner Fox. THE WEREWOLF LEGEND originally appeared in what was a new title for EC Comics, THE VAULT OF HORROR. It's first issue (chronologically numbered #12) hit the news-stands as the April-May 1950 issue, simultaneously with another experimental first issue title, THE CRYPT OF TERROR (chronologically labelled #17), which would by it's fourth issue be renamed as the more familiar TALES FROM THE CRYPT. 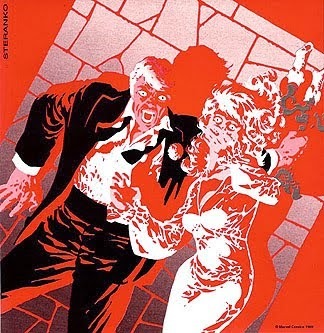 In another month a third horror title would be released, THE HAUNT OF FEAR, which provided EC with it's own trinity of terror that would catapult them to the forefront of the rising horror comics wave that was soon to sweep the nation, and ultimately would virtually cause the downfall of the entire industry. What is today known as "pre-code horror" comics was basically still in it's infancy at this moment in time, and over the next six years (1950-55) the artwork and stories would evolve (or devolve, as the case may be) into some of the goriest, grisliest, and most violently graphic comics ever to see publication. 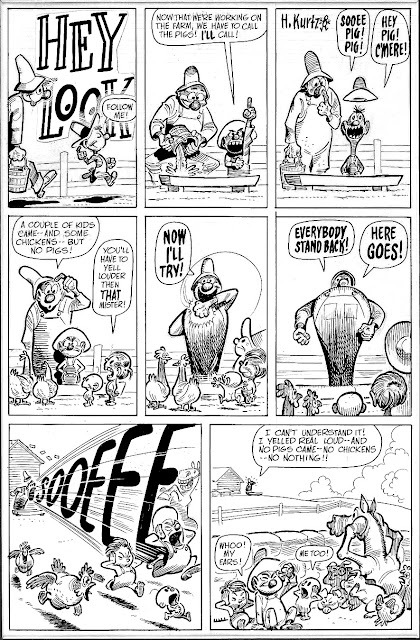 I've already featured the amazing and legendary Wallace Wood here several times, so I will not be repeating myself in any great detail for this post. Let us rather look at Harry Harrison. 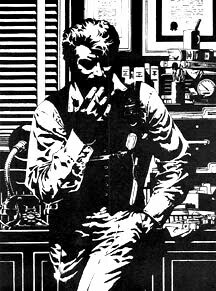 Readers of science fiction may be familiar with his name, as he is currently a well respected writer whose many works include the novels The Stainless Steel Rat (and it's subsequent sequels), and Make Room! 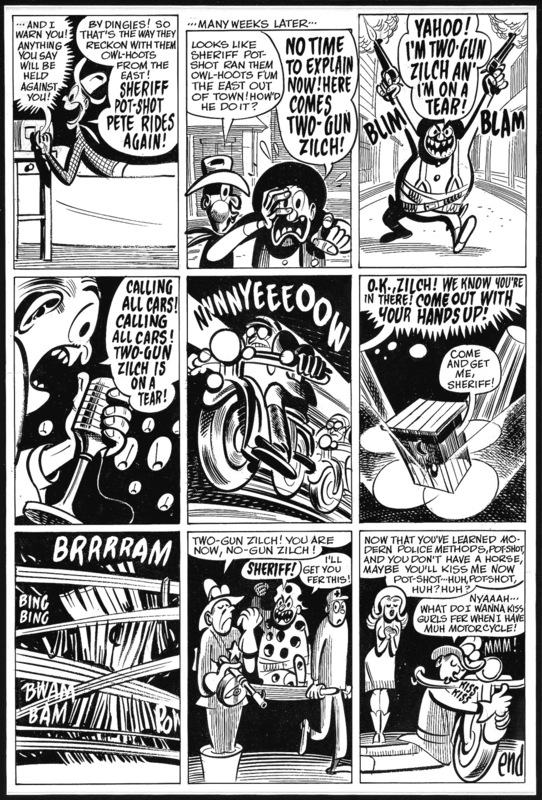 Make Room! 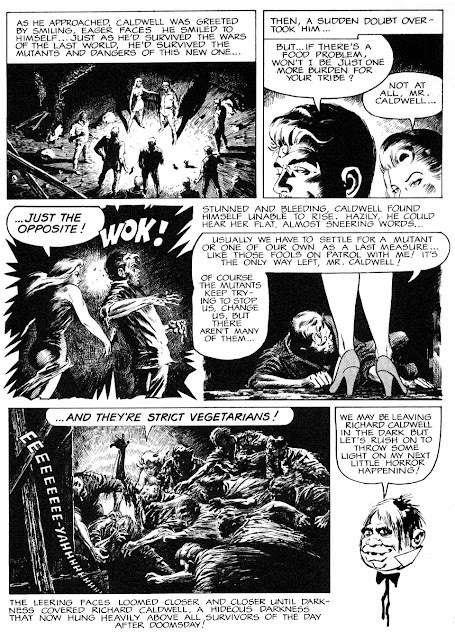 (which eventually became more well known as the film Soylent Green). Not only a gifted creative writer, Harrison was better known in the late 40's and the 50's as a fairly talented artist. 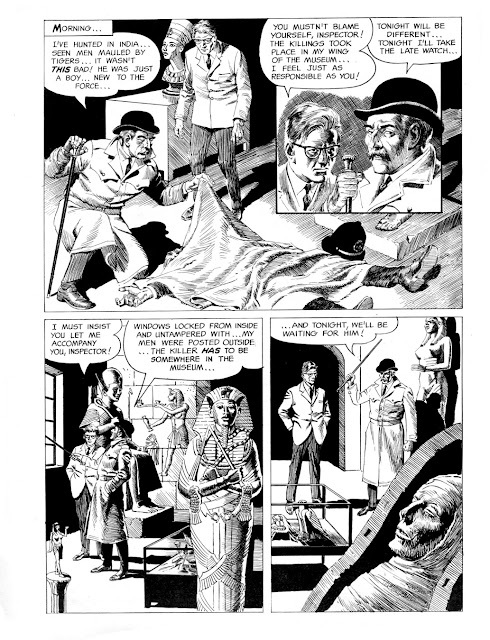 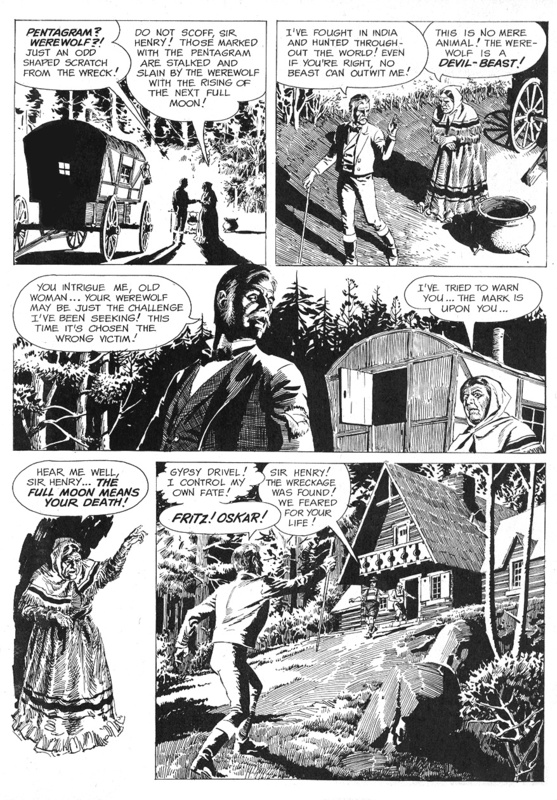 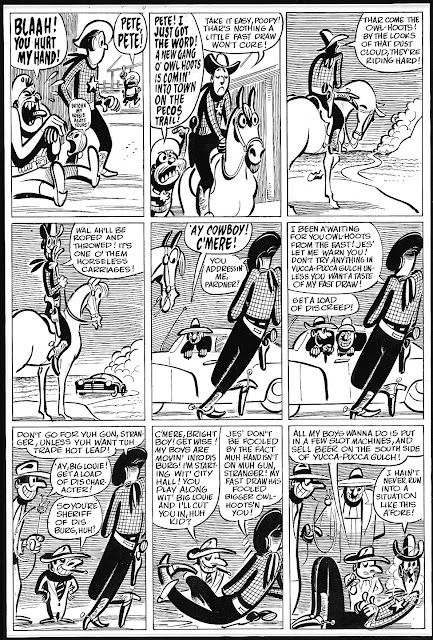 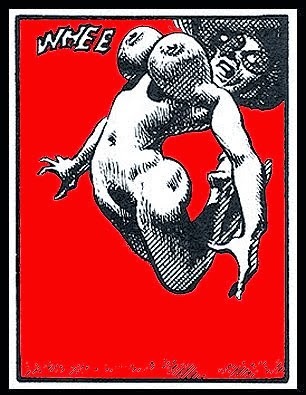 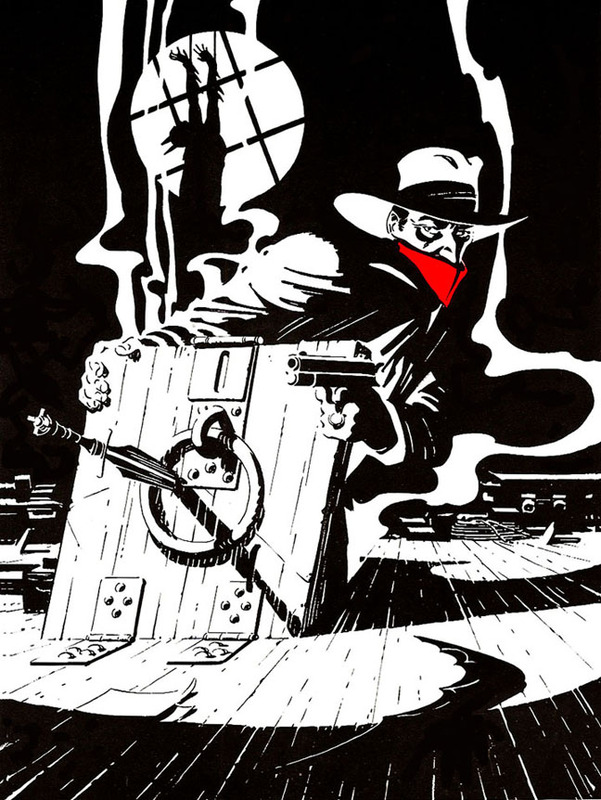 His work in retrospect tends to be overshadowed by contributions of his then-time collaborator Wood, who is now regarded as one of the greatest comic artists of all time. 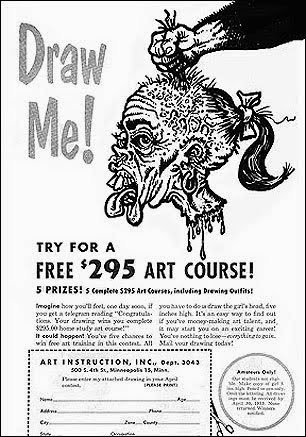 This is a shame, because Harrison is a talented artist in his own right. 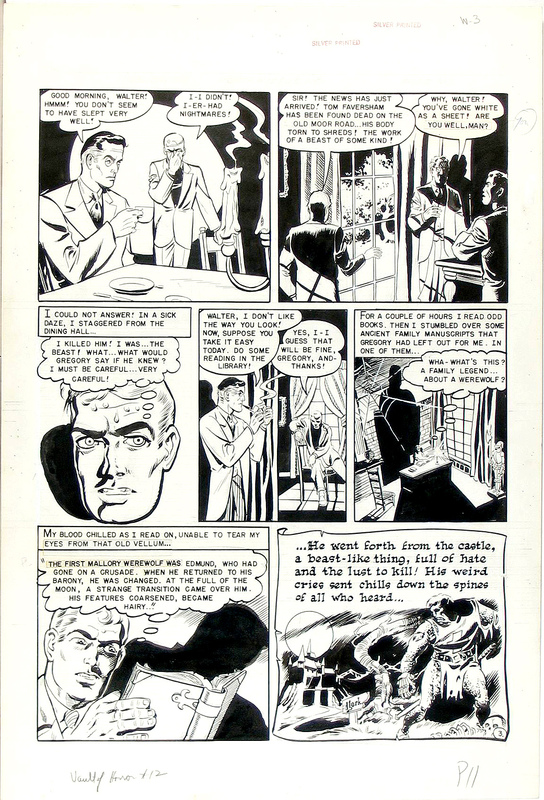 In 1948 both artists met and formed a partnership, doing art for both Fox and Avon Comics before they found their way to the EC staff in 1949, and were both developing their skills even further, both seperately and as partners, when EC launched their popular 'New Trend' comics line in 1950. The pair (and Harrison in particular) are directly responsible for talking EC publisher William M. Gaines into producing it's science fiction comics, WEIRD SCIENCE and WEIRD FANTASY. 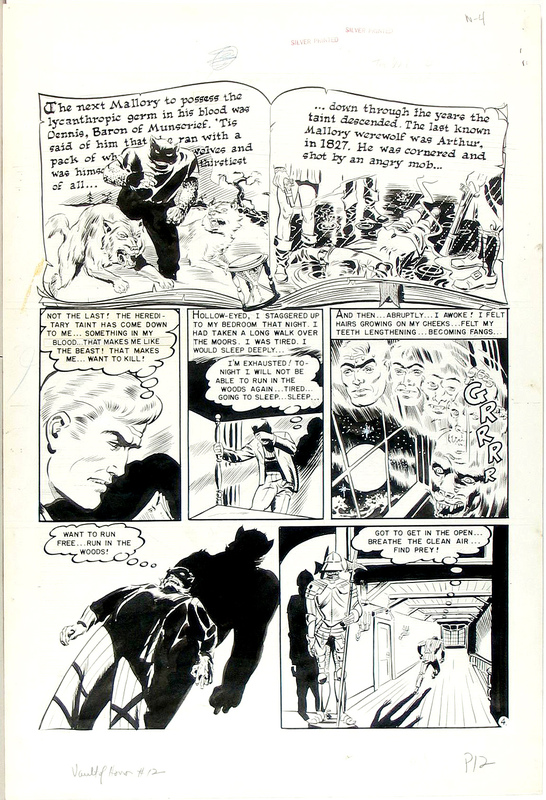 Gardner Fox is another well-known name in the comic book industry, having been a writer since the 1930's. 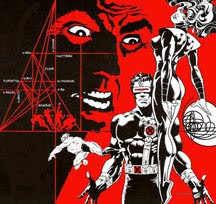 His prolific creative work is too great to mention here in depth, though he is perhaps best remembered at this time for being largely responsible for revamping the superhero genre for DC Comics in the 60's, being the creative force behind the Justice League Of America, The Flash, The Atom, and on and on. 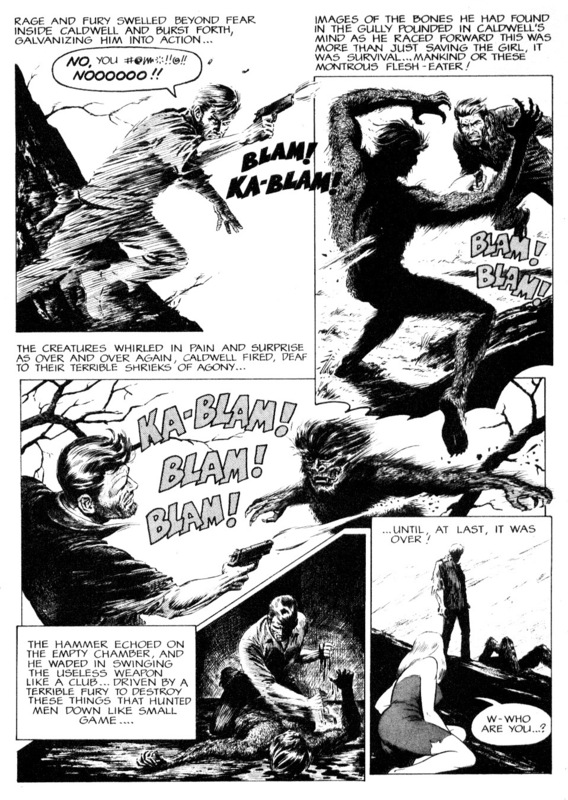 From 1947-50 Fox was the head writer for EC Comics, and that, my friends, brings us to today's story. 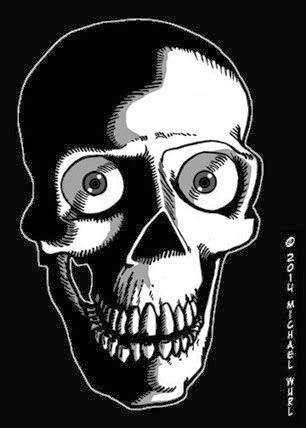 HOOOWWWLLL you ever manage to get to sleep tonight, I just don't know! 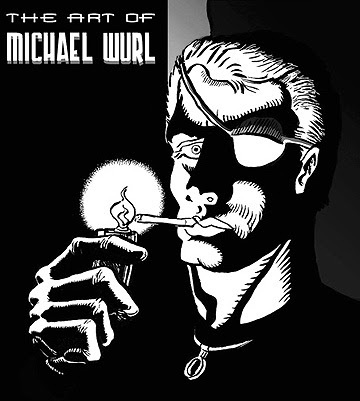 you can find his personal website by clicking right here! 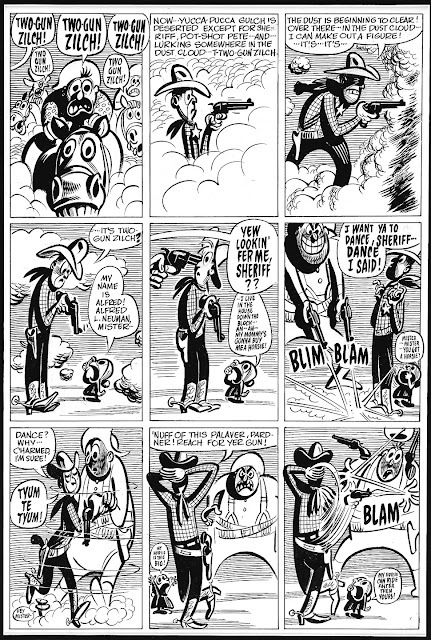 and inspiration as the legendary name of Harvey Kurtzman. 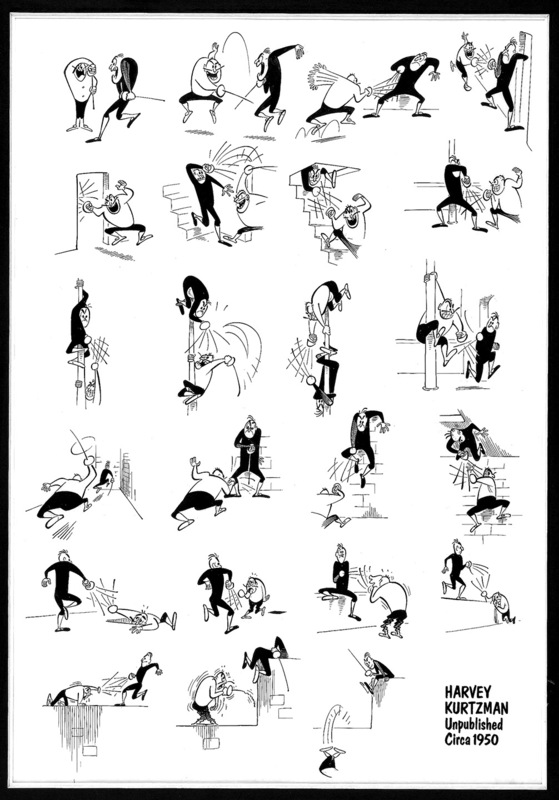 For decades, aspiring artists, writers, animators, and humorists have bowed before his work in reverent study to glean inspiration, seek illumination, and generate stimulation. Kurtzman possessed a rare genius of wit and creativity that have provided innumerable moments of imaginative entertainment for more than half a century. 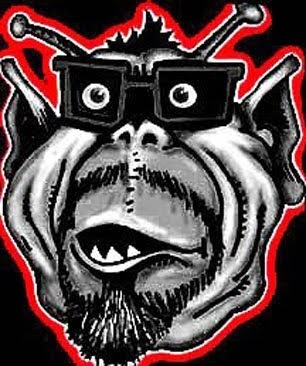 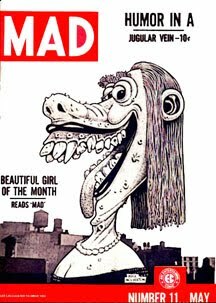 Even if you have never heard of the man, you have likely been influenced in some way by his far-reaching creations, the most well-known brainchild being one MAD Magazine. 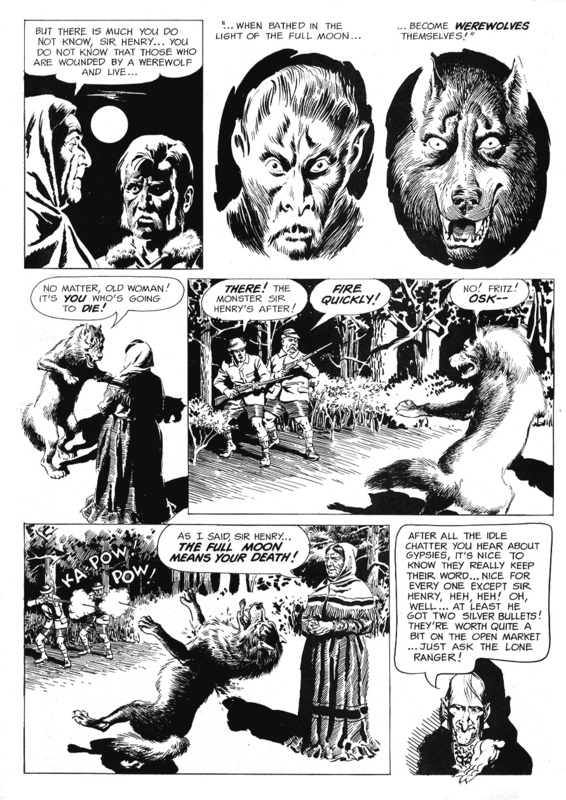 While acolytes of William M. Gaines and Al Feldstein may debate who conceived the original idea, there can be no doubt who was the original driving creative force behind the influential humor publication. 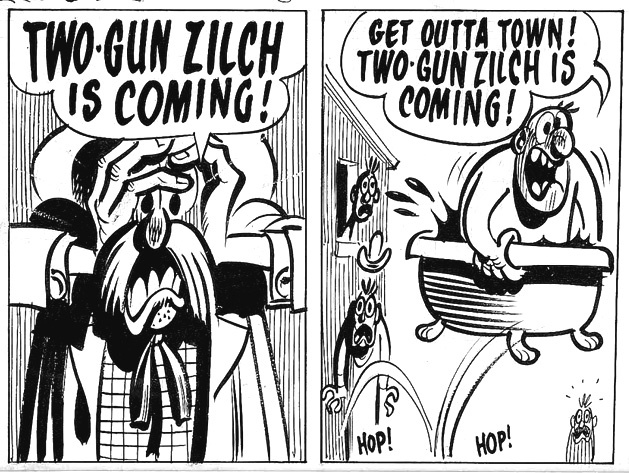 While he is just as revered for his ground-breaking war and adventure comics, as well as his innovative story-telling techniques, it is the culture warping humor of the zany MAD that will ultimately be Kurtzman's legacy. Prior to MAD's inaugural issue in October 1952, Harvey Kurtzman had been honing his craft with his hilarious HEY LOOK! 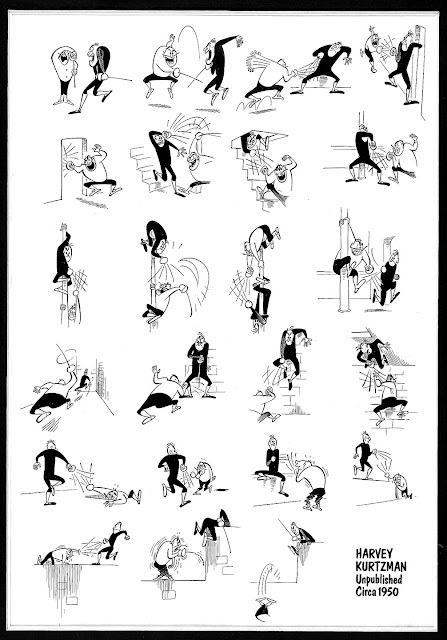 series of one-page gag cartoons published in various Timely/Atlas/Marvel comics since 1946. 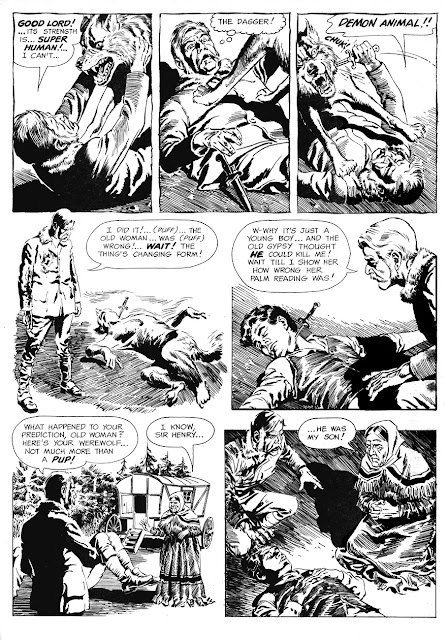 From there he joined the young and talented staff at EC Comics who would soon change the face of American comics, where he initially contributed dozens of stories for their science fiction and horror lines, but would later discover his niche as the editor, writer, and artist for EC's war and adventure comics TWO-FISTED TALES and FRONTLINE COMBAT. 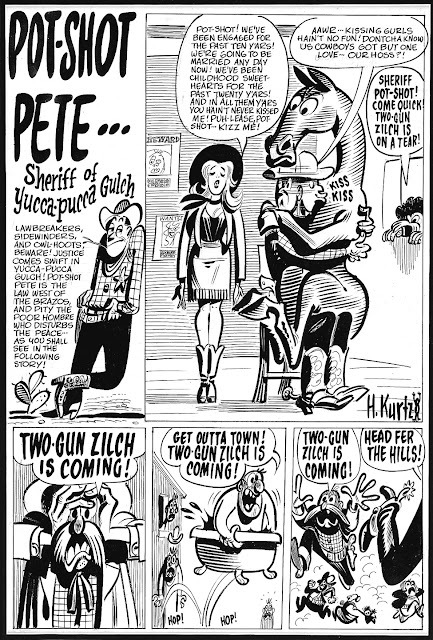 It was during this period when Kurtzman also conceived of the character of POT-SHOT PETE, a sheriff whose charmingly amusing adventures were published first by DC in 1950 as one page gags, and later that year by TOBY in JOHN WAYNE ADVENTURE COMICS, debuting in issue #5 with the 5 page story, POT-SHOT PETE vs. TWO-GUN ZILCH (which was later reprinted in MAD #15 and #18, both in 1954, under the title of "POT-SHOT PETE Sheriff Of Yucca-Pucca Gulch"). 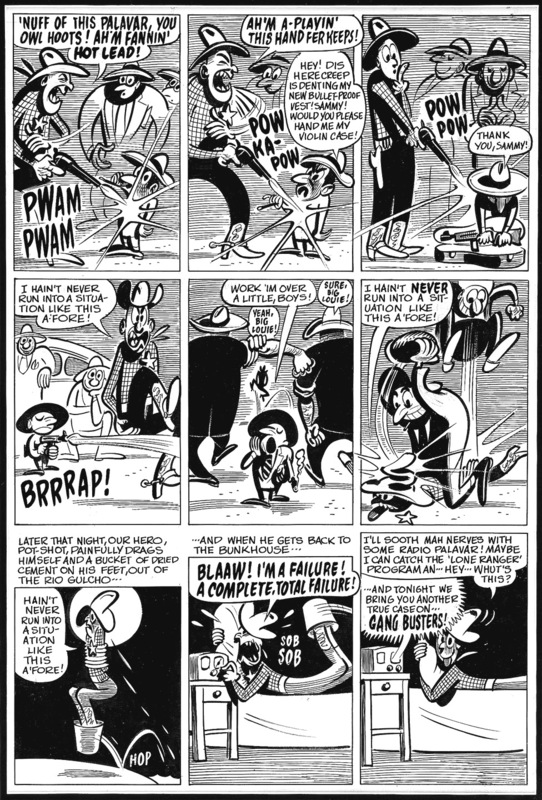 The delightful and amusing story is a playful mixture of Kurtzman's HEY LOOK style and his later MAD satirical story-telling. 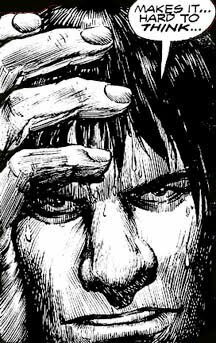 As I now reestablish tentatively from my self-induced exile and commence posting on my blogs once more, I will attempt to initiate re-entry here with a minimum of blathering and effluvium. 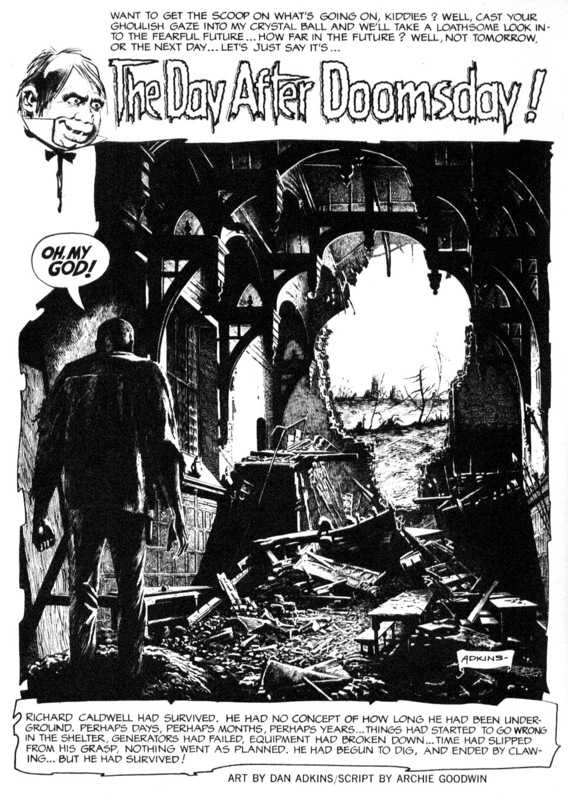 so you can rightly focus 100% on the wonderful artwork's that are mattering. 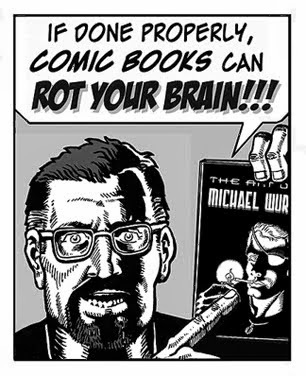 Urg...terrible word play, but that's what happens when I bite my tongue. 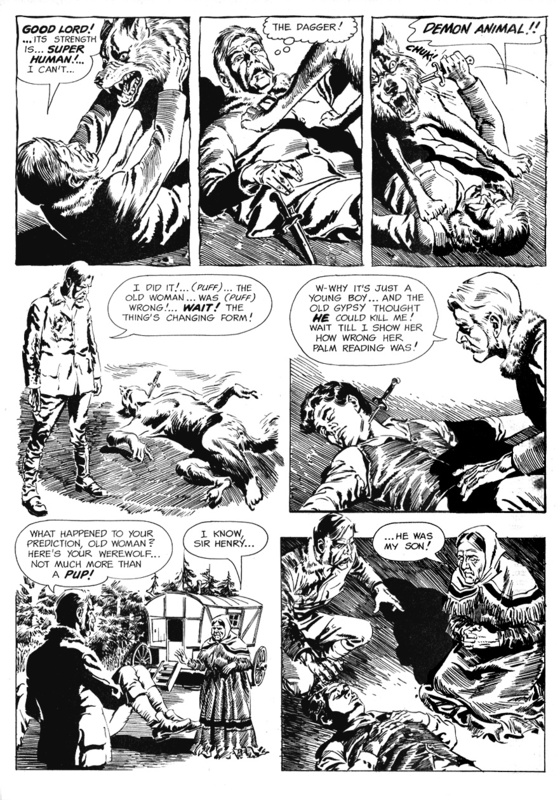 Reed Crandall (1917-1982) was an amazing artist and illustrator who brought a quality of professionalism to his work that tended to transcend the comic page. 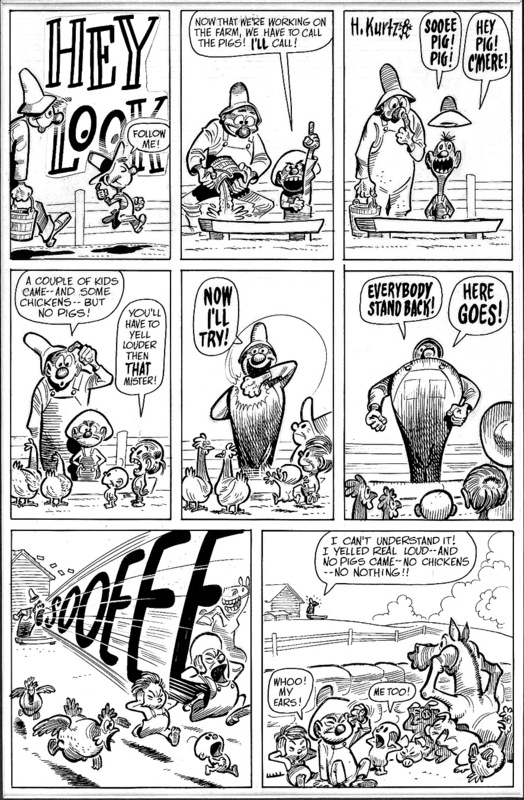 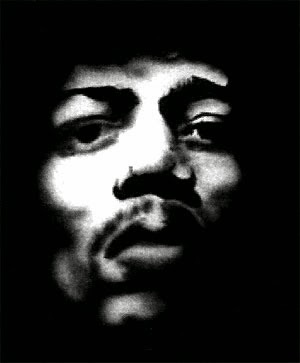 Even though he was said to be extremely humble and almost self-critical of his own work, his peers and fans universally esteemed him to be a master craftsman, and rightly so. His artwork in comics projected a sense of his illustrative skill for detail that could put technical draftsmen to shame. 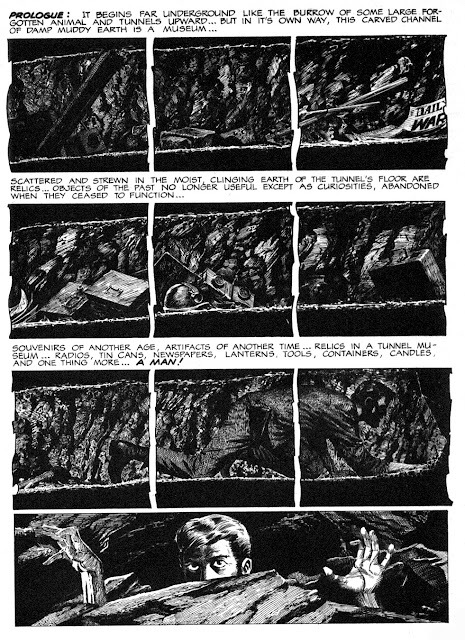 His artwork was basically almost too good to be in a comic book, but there it was, drawing in the reader with every delicate brush stroke. 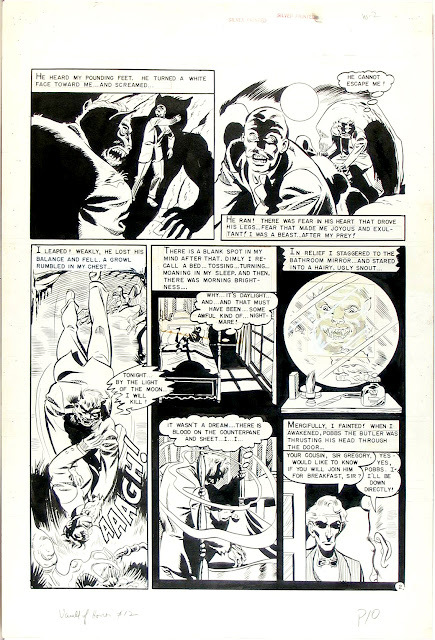 He received critical fame from the onset of his career in comics, from the early 40's when he brought his talents to heroes such as BLACKHAWK and many others, continuing into the 50's when he was a gargantua among gargantuas in the renowned EC Comics stable (heavyweights all), again into the 60's when he lent his pen and brush to masterpieces such as today's post by contributing to Warren's classic horror line, and right on up through the early 70's. Toward the end of his comics career it was known that health issues as well as alcohol played a role in hastening his downfall, but in 1965 when he drew "CURSE OF THE FULL MOON!" he was still quite able to bring the magic he was known for. 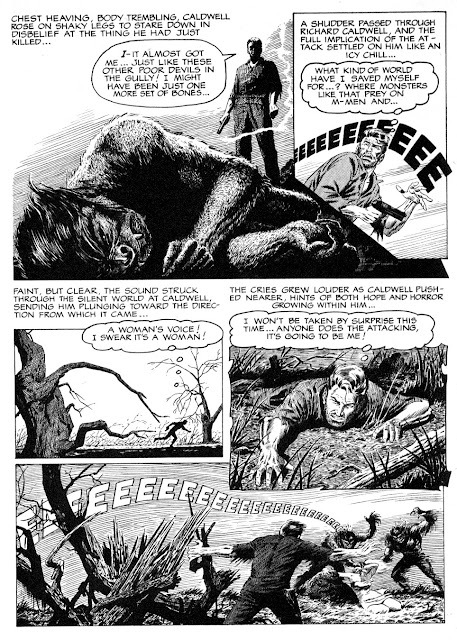 I'm not sure how many werewolf stories Mr. Crandall drew over the course of his life, but there have been an unusually high amount. 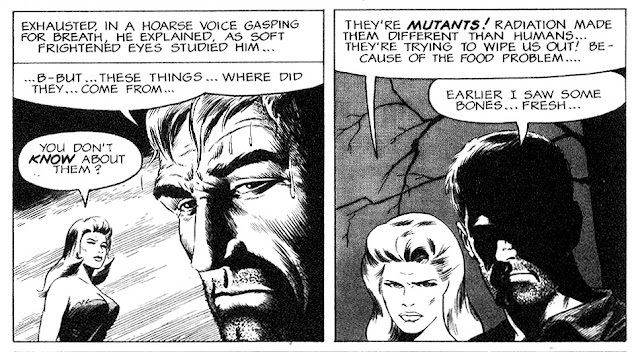 That is probably because he was so incredibly skilled at it. 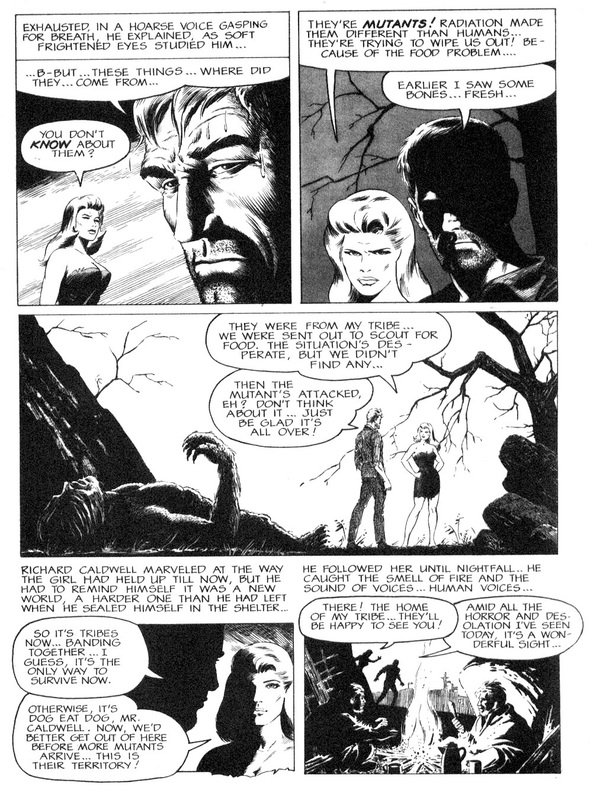 There were several done for the Warren books alone. 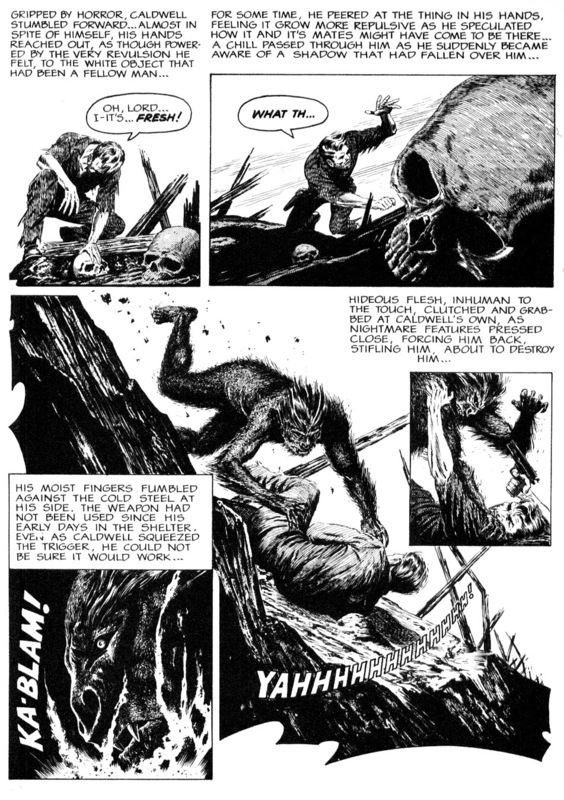 This horrifying lycanthropic chronicle was originally published in CREEPY #4 in 1965. 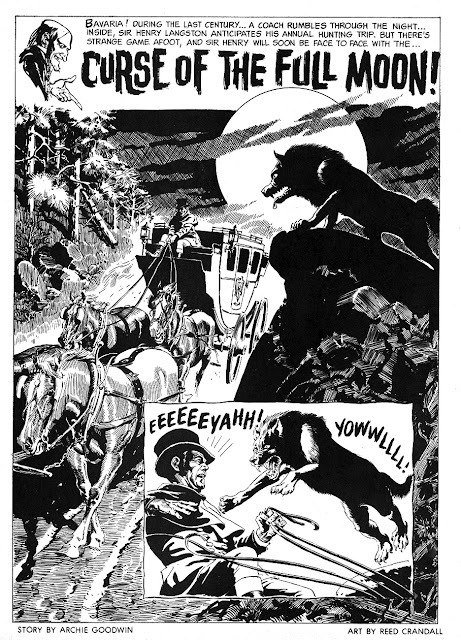 Don't you hate when the carriage you're riding in is attacked by a wolf and your driver gets killed? 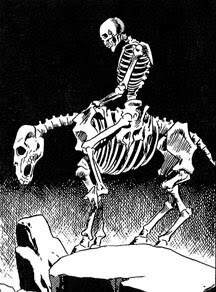 Whenever that happens to me, I just know it's going to be a long, rough night. Well, sure enough, that's just what happens in this classic tale, too, deftly written by Archie Goodwin. 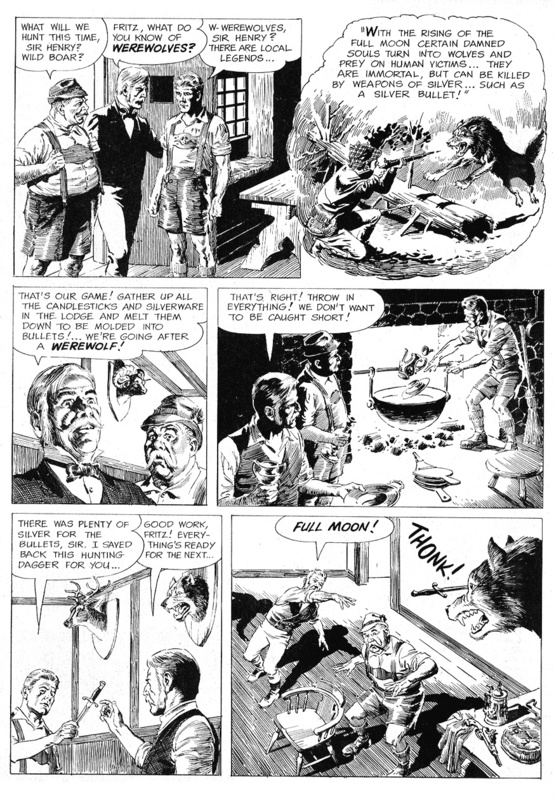 "CURSE OF THE FULL MOON!" 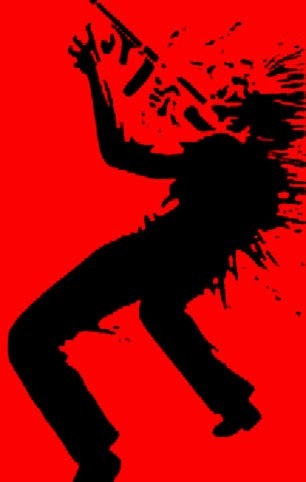 That was good nasty fun, eh? 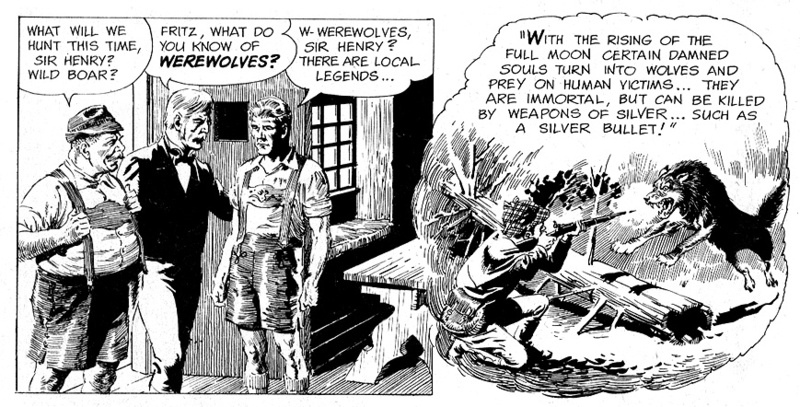 In case this happens to me, I always wear my wolf-whistle! If you want to see another masterful werewolf tale by Reed Crandall, this time in color, click right here!